Another album I cannot pry off the turntable. How annoying and irresistible it is! I love the black and white images on the cover. Maggie, Suzzy, and Terre. They look so smart and mean and free. Which is the one with funny low voice? And what a surprise, in “Hammond Song,” to hear that unmistakable fuzzy Fripp guitar – the first time I heard it I said, Wow it can’t be! Such complex harmonies and counter points. Like a barbershop trio. There’s Robert Fripp again. At the Buffalo Folk Festival, I said to Suzzy, The way you sing together reminds me of the complex harmonies in barbershop quartet songs. And she was way shorter than me but she came up to me right in my face and said LIKE WHAT??? And I was taken aback by her effrontery, her strength. I did not say I had sung the baritone lines in many a barbershop song – “Ida, sweet as apple cidah” – I was shy. How much fun they must have had as kids wailing gospel songs and folk songs and the Alleluia Chorus at the top of their lungs. 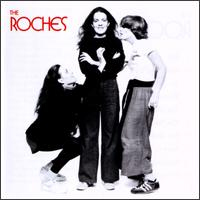 The Roches, The Roches, Warner Brothers Records, BSK 3298 (1979). Photography – Gary Heery; Album Design – Brad Kanawyer; Art Direction – Peter Whorf.